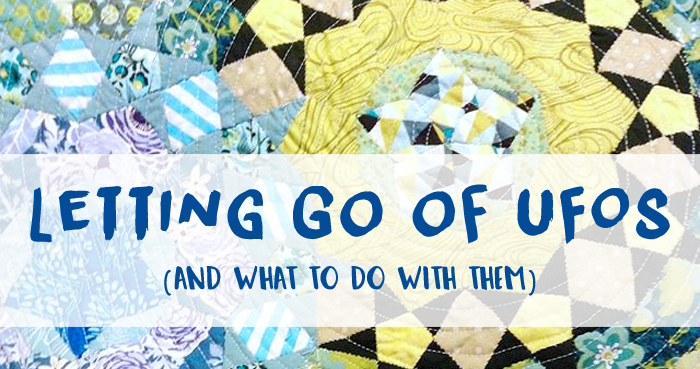 The longer you quilt, the more likely you are to accumulate a few UFOs (unfinished objects). I used to think of myself as a dedicated finisher, but I've learned that no one is immune to the dreaded UFO. As my WIP pile grew, older projects got buried and my interest in them waned. For a while, I'd nag myself that I needed to finish those projects for good all the while longing to work on something else. I gradually accepted that UFOs are inevitable and it's okay to let some of them go for good. We set aside projects for a variety of reasons. Maybe you made a mistake that you're not sure how to remedy. Or maybe your fabric choices aren't playing out the way you hoped. Sometimes our moods and tastes just change. I know I'm not the only one who has thought, "I can't believe I used to like this." What's the point of forcing yourself to work on a UFO that no longer excites you? Many of us quilt for the joy it brings, and when something feels like a chore, the joy drains, and you risk burnout. Give yourself permission to throw in the towel and pursue other projects. But what is one to do with abandoned UFOs? There are several options. Donate it. Ask a guild if they'd like to adopt your UFO as a charity project. Making scrappy quilts out of orphaned blocks is a common practice I've heard of. Pass it on. Let a friend breathe new life into your project and make it their own. Sell it. Set a price and post your UFO on Instagram with the hasthtags #thegreathandmadedestash and #thegreatfabricdestash. "One persons's trash", you know? I recently sold my bungled La Passacaglia to someone who adored it and is taking the time to fix my mistakes. Recycle it. If the fabric is stash-worthy, rip out the seams and add the fabric back to your scrap bins. Otherwise, donate it to an animal shelter. Some shelters use scrap fabric to stuff dog beds and the like. Store it. If you're not quite ready to make a final decision, neatly pack your UFO in a plastic bag or container and store it out of sight. It'll take the pressure off, but still be available if you choose to return to it. Making quilts is fun and I fight against the occasional urge to impose work-like constraints or obligations on myself. I work through the 'can't be bothered' stages of quilts I want to make but I'll be darned if I'm going to pretend it's a job and make myself finish stuff I'm not enjoying.